In addition to the beautiful locations, the amazing Cretan cuisine, the rich history and culture, what stimulates the summer residents of the island are the best Crete Beaches . Whether in the south, with the warm, turquoise waters of the Libyan, or the north, where the green and the rocks offer their shade and coolness, Cretan beaches are among the best beaches in the World. 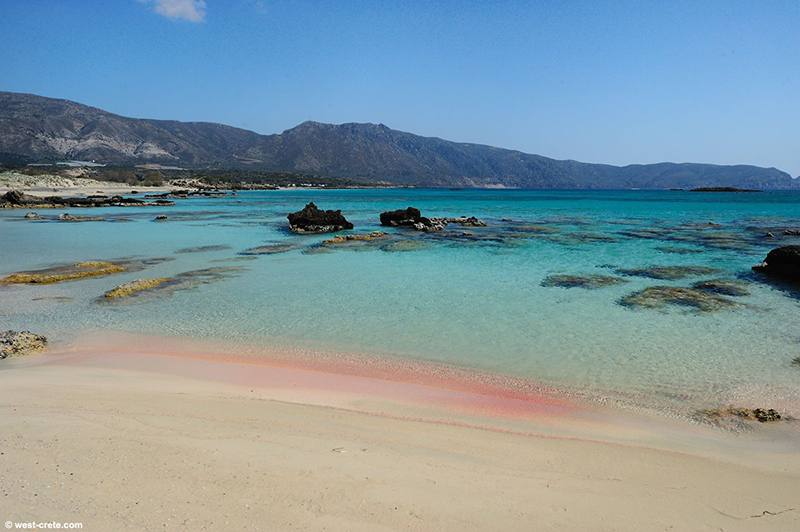 Elafonisi Beach: In the southwest of Crete, about 80 km from the city of Chania, lies the magical Elafonisi, an exotic beach with dunes of white and pink sand, crystal clear, shallow waters and peaceful landscape. 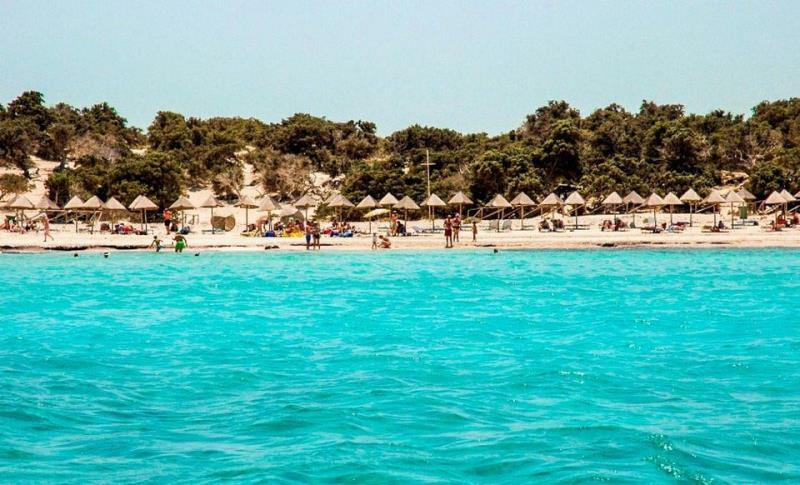 During your visit at Elafonisi you can make a stop to the impressive Kedrodasos (cedar forest) beach which is nearby. Look for vacation villas near Elafonisi. Balos Beach (Gramvousa): Same colors and pictures as Elafonisi you can also enjoy in Balos, in the northwest of Crete, on the peninsula of Gramvousa. The golden-red sand combined with the turquoise waters is impressive, but even more pleasing is the fact that this is one of the quietest and “natural” Crete beaches of the island. 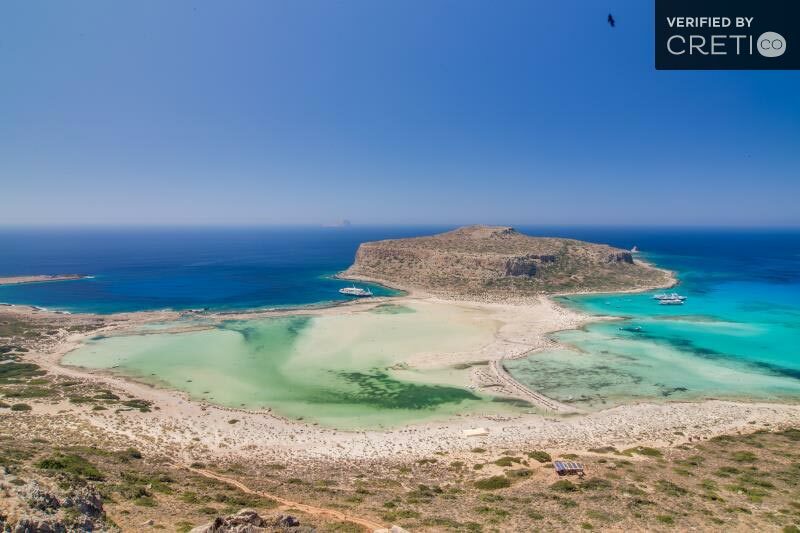 You can reach Balos by one of the boats leaving from Kissamos, by car through a quite difficult road and by bus. If you visit Balos you can visit the well-preserved Venetian castle-fortress which is located at the top of the mountain of Balos island. See luxurious holiday villas near Balos. Falassarna Beach: In the northwest of the island, 17 km from Kissamos, Falassarna is maybe the most beautiful beach of the island. 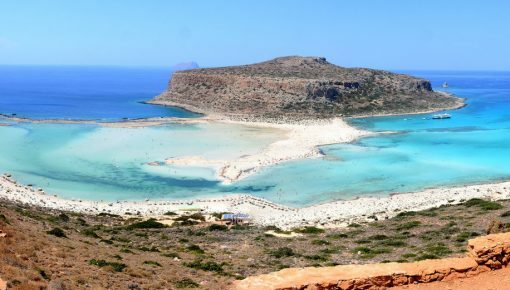 It has been awarded several times as the best beach of Greece and is constantly included in the best Crete beaches of the world together with Balos and Elafonisi. The almost pink sand, the clear, turquoise waters and the surrounding mountains offer majestic scenery! The beach is organized and large enough to offer plenty of space for the thousands of tourists visiting it during the summer. Find a holiday villa near Falassarna. Seitan Limania Beach: Seitan Limania, located in Akrotiri, is a beach with crystal clear waters surrounded by rocks, in a small creek. Situated in the northeast side of the Akrotiri peninsula in western Crete, 20 km from the city of Chania, it is a beach different from all others. The water penetrates the cliffs of Akrotiri, creating small coves. In one of them is formed one of the best secret beaches of Chania. As it is a small cove, you should avoid the peak season and visit it early or late in summer. However, the beach is still not organized so you should care about bringing the necessary stuff with you.To reach the beach, you need to walk about 20 minutes via a quite passable path, starting from the point, where you live the car. Bali Beach: This is not Bali of Indonesia, this is Bali of Rethymnon! This charming, small fishing village, is located about 32 km from Rethymnon, and has a clean beach with small pebbles. There you will find sun beds and umbrellas, and you can have fun by doing various water sports. Very close to this beach you will find other, much more quiet beaches and traditional sea view villas. Plakias Beach: About 40 km from Rethymnon, Plakias is one of the longest beaches of Crete, with clear water and sandy shore. 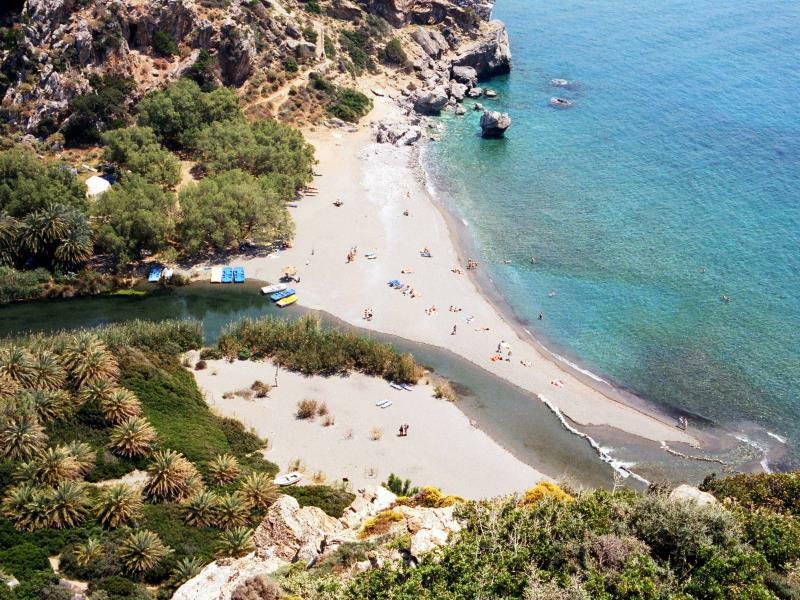 Plakias beach is also popular to naturists. Find a wide range of vacation villas in the area. 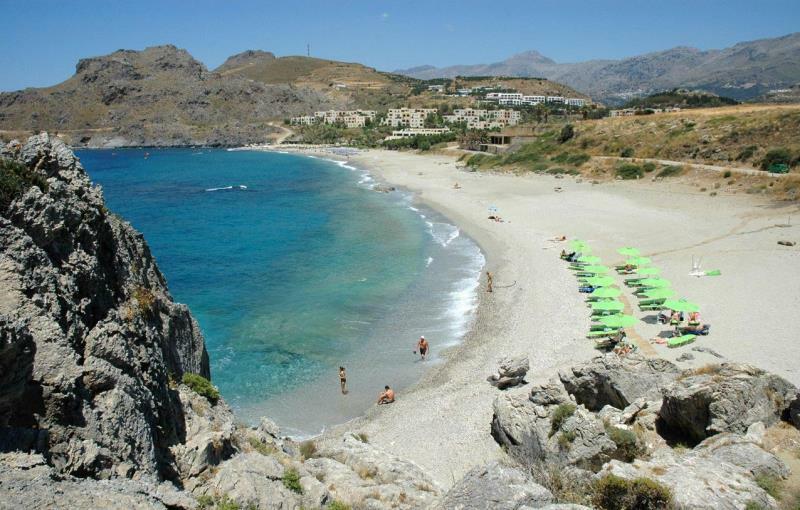 Preveli Beach: Preveli is located about 35 km south of Rethymno and 10 km east of Plakias. 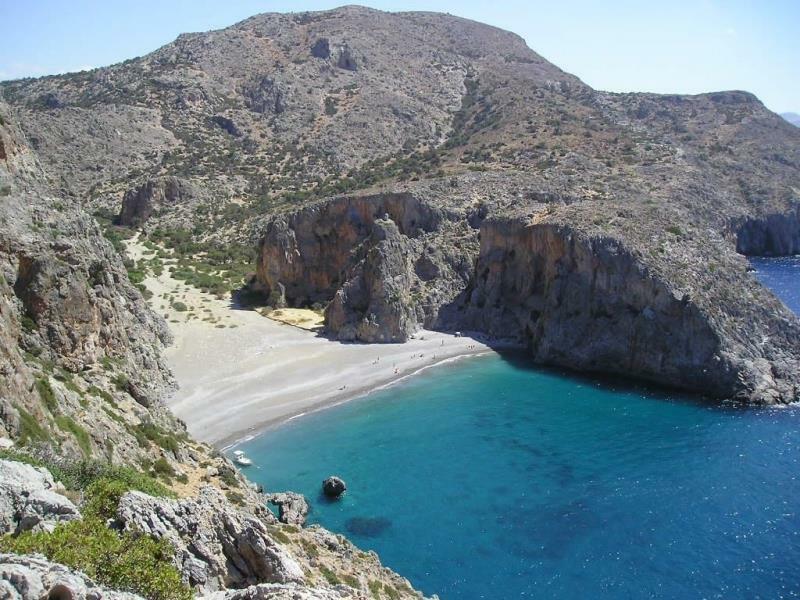 The beach of Preveli, also known as “Phoenix”, is located at the exit of the imposing Kourtaliotiko gorge, crossed by the Great River. 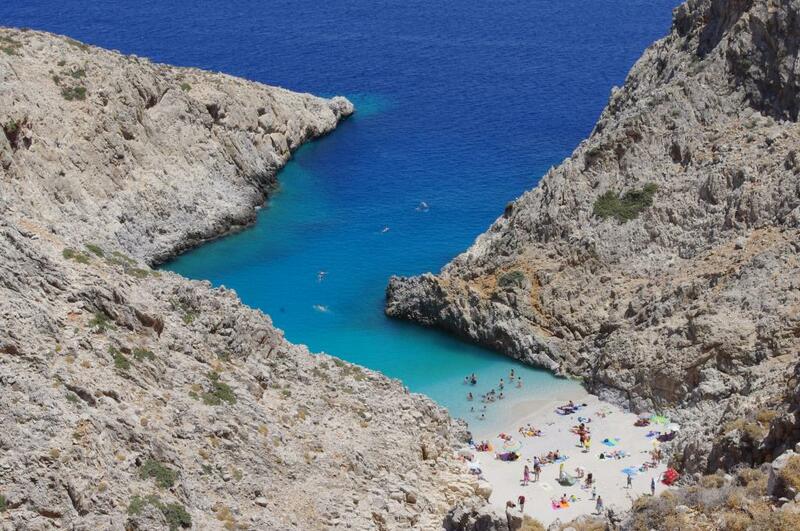 It is certainly one of the most famous beaches of southern Crete and attracts thousands of visitors every summer. Some years, it was a favorite location for hippies. On the banks of the Grand River, there is a large grove of palm trees which gives the area a sense of African landscape. At the exit of the river, there is a sandy beach with pebble bottom and very cool waters because of the river. In the eastern part of the beach there is a beautiful rock, that looks like a mast. It is poorly organized, without umbrellas, and there are few restaurants and snack bars nearby.There are also rental pedal boats for a ride on the river. It is worth to find a traditional or modern vacation villa close to Preveli, in Rethymnon area, and visit this heavenly beach. Look for holiday villas close to Preveli. 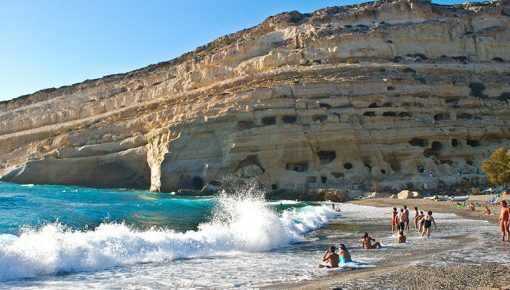 Matala Beach: The little fishing village, 70 kilometers from Heraklion city, is famous as a haven for hippies in the 70’s. However, it is not surprising that they chose the particular beach to enjoy their summers. Fine sand, white cliffs to protect it from the winds and crystal clear waters are just some of the physical characteristics that make Matala beach attractive. The small artificial caves from one side, and the relatively recent development of tourism on the other, create options for every type of traveler. The beach is organized, while in the area around, there are restaurants, bars and cozy holiday villas offering high standard facilities. 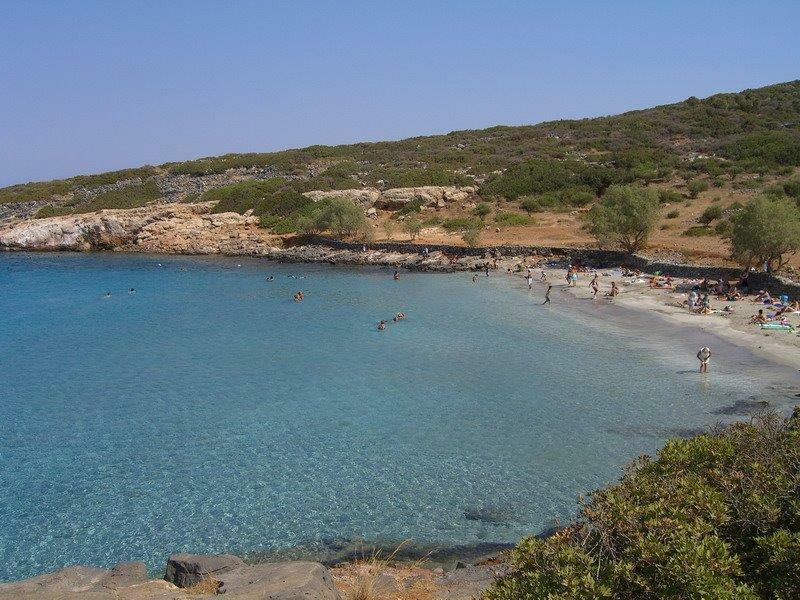 Agia Pelagia Beach: About 24 km northwest of Heraklion, is Agia Pelagia. The small, closed, green bay, with crystal clear waters and the amenities of the area are just some of the reasons it is worth to go and dive there. Another reason is that the beach is completely unorganized and the shade is created by the surrounding green rocks. Look at some of the wonderful sea view villas in Agia Pelagia. Malia Beach: You have definitely heard of the region as an “orgies place” of English tourists. First, the existing situation has been particularly improved in recent times, since the authorities control more frequently the region and appease the “noisy” visitors. 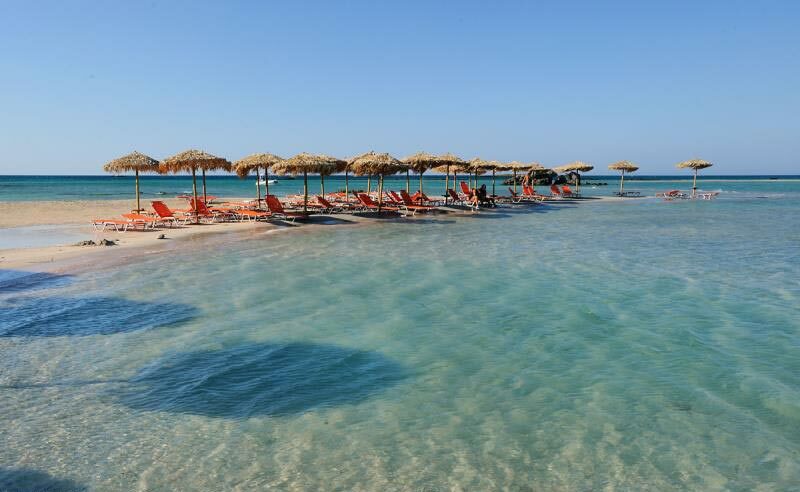 Secondly, no reason is enough to prevent us from visiting the wonderful, organized, sandy beach of Malia. There, you will enjoy water sports and other facilities such as restaurants and bars and traditional stone made villas. 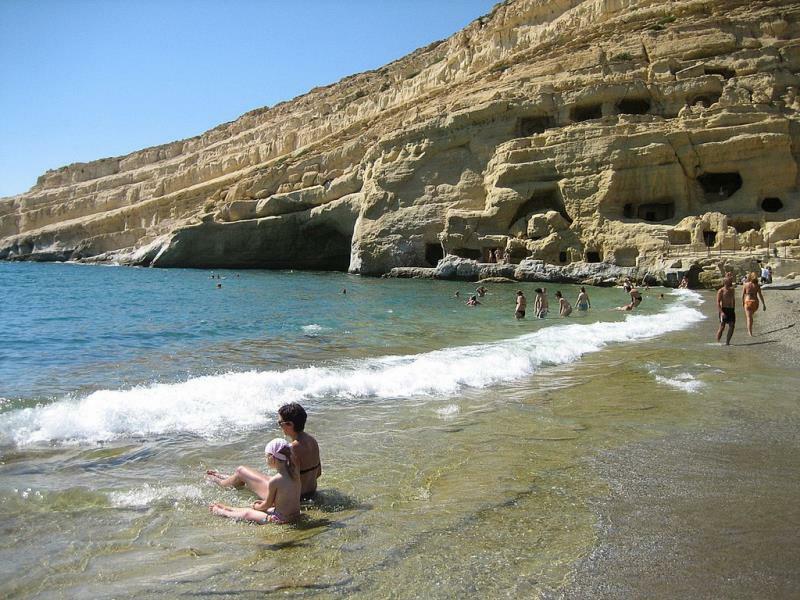 Agiofarago Beach: If you are looking for a really secluded and inaccessible beach, Agiofarago, in the south of the island and very close to Matala, is ideal. You will discover the beach, perched on the lap of a steep canyon, with crystal waters and paved with pebbles. You can get there, either by boat from Kokkinos Pirgos (a small village 2 km west of Timpaki) or descend the canyon -the journey takes 15-20 minutes. Find comfortable vacation villas with private pool in the areas close to Agiofarago beach. 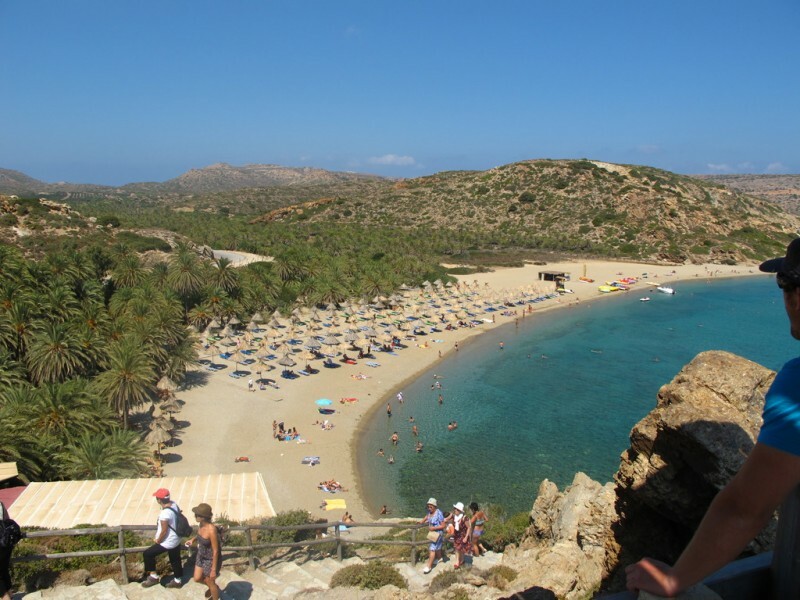 Vai Beach: East of Sitia and about 100 km from Ag. Nikolaos, on the cape Sidero, is the beautiful Vai, with its rich palm grove, the fine sand with a few pebbles and turquoise waters. Although the beach is organized, the umbrellas are combined harmoniously with the dried palm trees. Click for luxurious holiday villas in the areas near Vai. Kolokytha Beach: Kolokytha (Pumpkin) beach is located in Elounda area about 16 km from Agios Nikolaos. In order to get to the beach, you must enter the village of Elounda and head to the famous street with the salt marshes. Passing this path and after a steep road, you end up in the church of St. Luke. You must leave your car there and continue on foot. Going down you will see the beautiful beach of Kolokytha! Turquoise waters and white sand make a heavenly and exotic scenery. On the beach there are trees offering relaxation under their shade. Surely, the beach Kolokytha is one of the most beautiful beaches of Crete, and you can find a beautiful sea view or sea front villa in the area of Elounda, in order to enjoy it. Find lots of holiday villas in Elounda. Xrysi Island: Xrysi is one of the 81 uninhabited islands of Crete and is only about 8 miles south of Ierapetra. Locals call it “Gaidouronisi” or simply “the Island”. The length of the island is 5 km and width of 1 km. The highest point is called Kefalas and it is at a height of 31 meters. It is a paradise with beaches of golden and white sand, crystal clear waters, olive trees and countless small shells along the coast! Throughout the length of the island, mainly in the center, there is the cedar forest with trees of over 200 years old! At the north of the island you can find organized beaches with sun beds and umbrellas for rent and some more unorganized beaches for you to explore. On the south eastern side of Xrysi, there is the picturesque port with the boats which carry visitors to the island, a tavern for lunch and coffee and a beautiful beach with sun beds and umbrellas for rent. You can visit Xrysi by boat from Ierapetra. 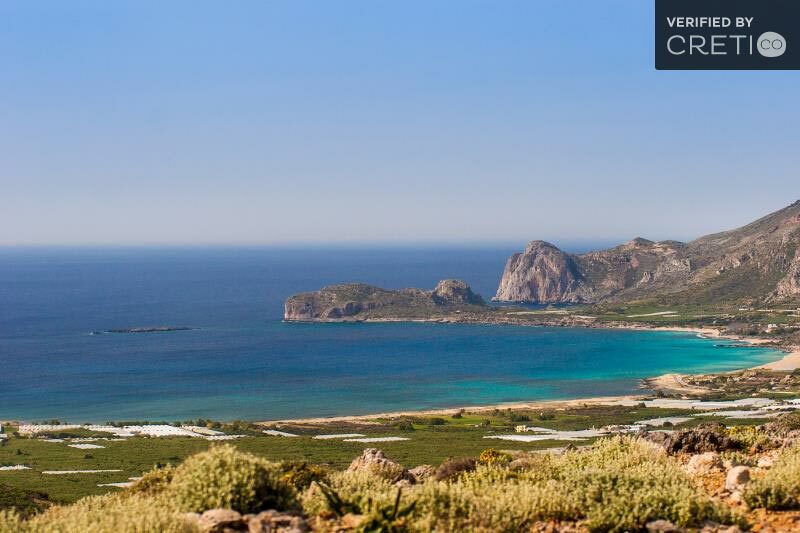 Find a villa close to Ierapetra to get the chance to explore Xrysi island. 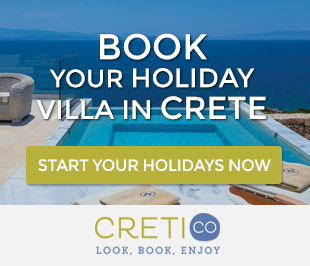 Check our Top Crete Holiday Accommodation Guide and book the villa of your dreams in Crete in order to visit the amazing Crete beaches of the island.! Posted on 15 Jan 2015 in Holidays in Crete and tagged Agia Pelagia, Agiofarago Beach, Bali, Balos Beach, Beaches In Chania, Beaches In Crete, Beaches In Heraklion, Beaches In Lasithi, Beaches In Rethymno, Best Beaches In Crete, Chrissi Island, Elafonisi, Falassarna, Kolokytha Beach, Lasithi, Matala Beach, Preveli Beach, Seitan Limania, Vai Beach.